An upgrade from Delcam’s ArtCAM Express to ArtCAM Pro paid back more than double its cost on the first project undertaken by Island Cabinetry and Millwork (ICM). 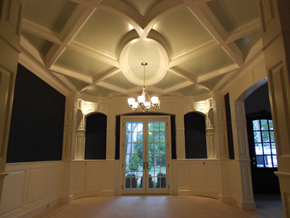 The project was a unique ceiling for a new home that included multiple arches and beams intersecting with each other. ICM is a woodworking shop in Patchogue, New York, that produces custom cabinetry, arches and millwork for new and renovated homes. Five years ago, the company substantially increased its productivity and accuracy by designing arches and other 2D products in ArtCAM Express and cutting them out on a CNC milling machine. ICM could design and build a door arch in three hours, compared to 16 hours that was required previously. It won many new customers through its ability to offer high-quality work at an affordable price. More recently, the company has taken another major leap forward by upgrading to ArtCAM Pro to design and generate CNC programs to produce 3D millwork. The purchase was prompted by a high-end design-and-build firm which asked ICM to bid on designing and building an unusual 3D ceiling design for a multimillion-dollar, custom-specification home. The design consisted of an oval forming the centre of a grid, with both the oval and the grid consisting of arched crown mouldings. The customer had three designers on its staff but they were unable to produce the design internally.